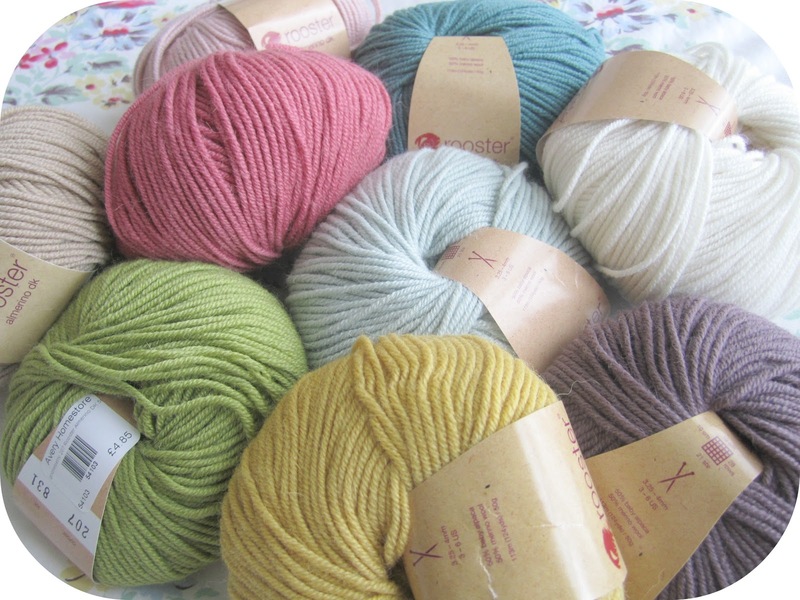 What with these cosy autumnal evenings, I rather fancy starting a new little crocheted lap blanket. I'm not terribly sure whether it will be striped, rippled or squared. I thought I'd keep my eyes peeled for the right yarn and wait for inspiration to strike. It didn't take long for me to fall in love. I sort of cheated when it came to choosing the exact colours. This combination came in a preselected 'inspiration pack' from here. I made it up as I went along. I've always loved the combination of lace and wool. It perhaps needs the odd tweak here and there but, otherwise, I'm tickled pink. The only problem? Making another to match and I'm not terribly sure if I can remember exactly how! Oh well, I like a challenge. Either that or I'll just have to keep one hand stuffed in my pocket at all times! It does match my new brooch perfectly though. Still having a think about that blanket. Fantastic colours and I just love that glove. How I wish I could knit and knock up things like that for myself! I've never been a yellow fan but there have been some lovely zingy yellow things in White Stuff this season. 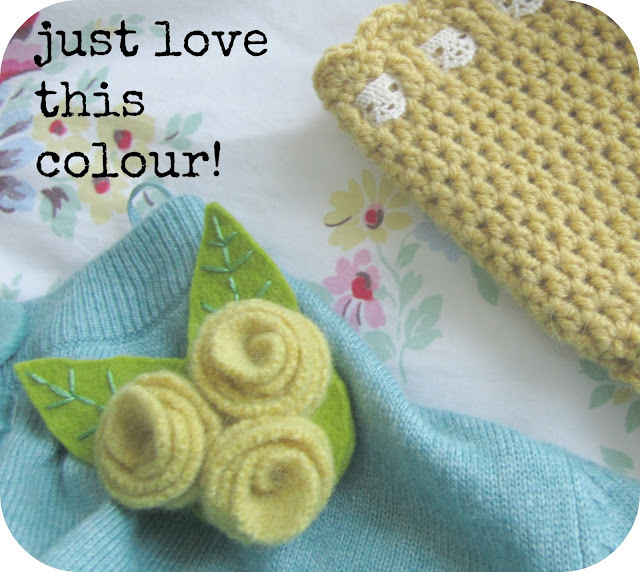 I LOVE the colours, they would make a beautiful blanket...or maybe one or two small items and a cushion instead :) The wristwarmer matches your new brooch perfectly, have you started on it's partner yet? 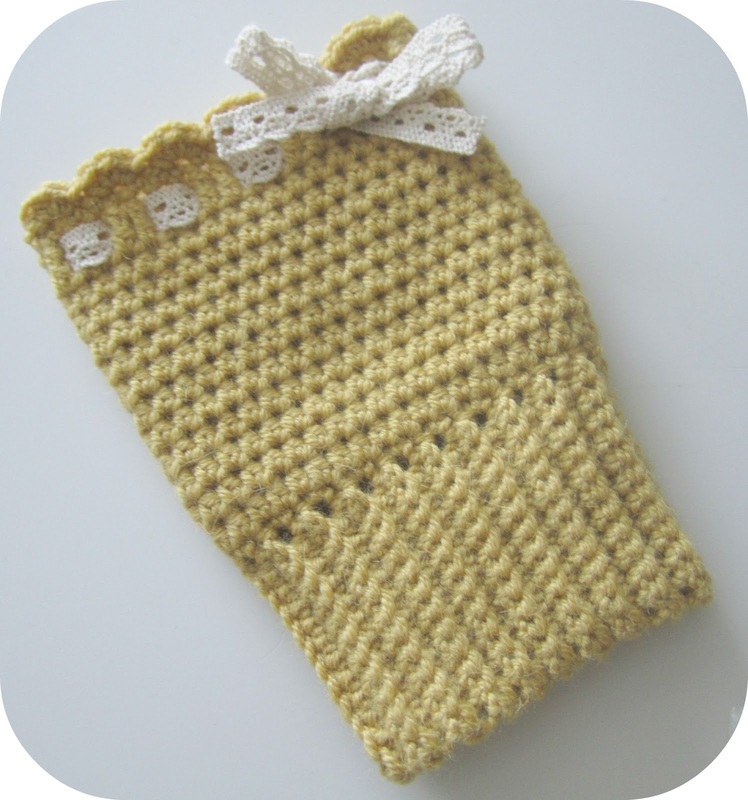 Ooh I LoVe that gorgeous yellowy colour, your wrist warmer is extremely pretty! That is gorge!! Well done Heather! Really behind of blog commenting at the mo but saw this and thought it was so pretty and very different. Funny how taste go full circle. 15 years ago it was all about yellow for me. I had yellow walls, yellow carpet, yellow ceiling...I kid you not. At the time it looked nice, honest. Then I couldn't stand yellow. For years I have avoided it yet here I am now drawn towards yellow once more. I think the way forward is to channel your inner Michel J and have just the one wrist warmer. 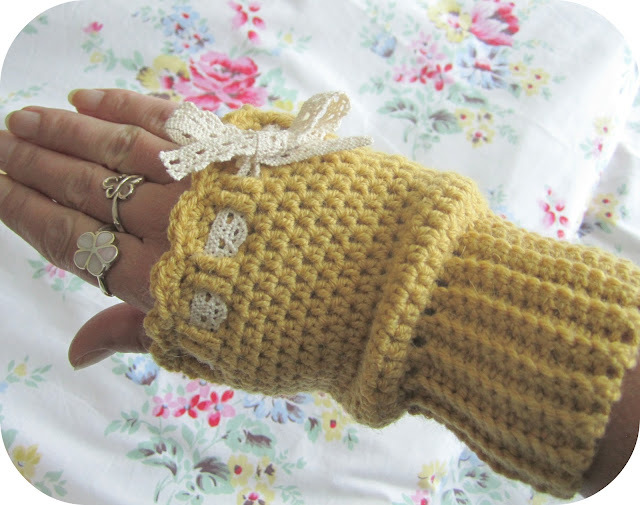 Ooooooh i LOVE the glove, lace and wool, I've never thought of that before, but is sooooo works. I bought some similar wool colours a few months back, with the idea of making a blanket for a friend ( christmas present ) I had completely forgot about it, so thanks for reminding me! Soooo inspiring! I just love the selection of yarn and it does look so soft....and your wrist warmer is gorgeous!! The shade is very beautiful :) I hope you can work out the pattern to make the second one, it will be worth it! Lovely to see you back again, Heather. Have a lovely weekend. Oh H, I love the look of that yarn and your wrist warmer is gorgeous! I love crochet lace too :) you are good for getting back into blogging, I just can't seem to at the moment. The colours are lovely, I think they will be this months payday purchase. I have fallen in love with that colour selection you bought! It's just gorgeous. Have fun with it! Those colours are gorgeous, must try that wool. 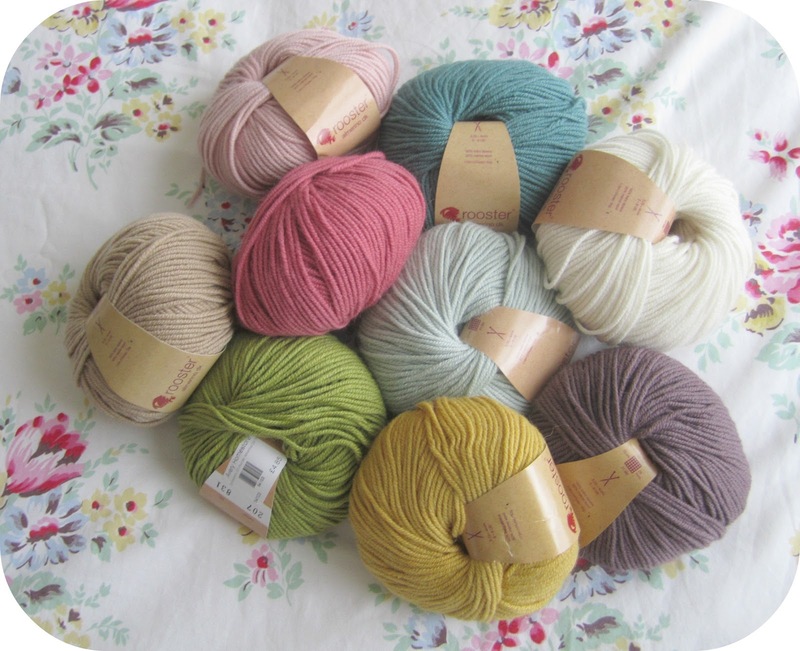 It looks like Sirdar Sublime... I'm on with wristwarmers at the mo, lots of them for presents, and I'm like you, I tweak the pattern then forget what I did!! I have been so wrapped up with fabric and sewing lately that I have neglected my passion for beautiful yarn... I have to say though that after reading this post I am positively swooning!! That is the most delicious selection of colours. 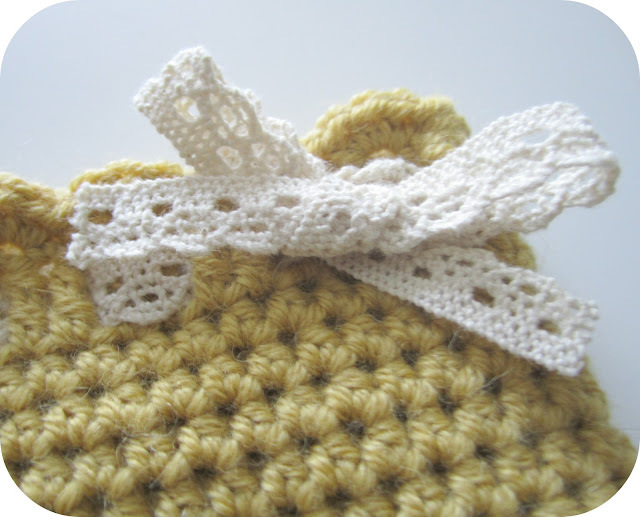 I think I may have to get my hook and a soft yarn from my stash this evening and get crocheting! Thank you for the inspiration and I cannot wait to see what you choose to hook up yourself. PS- I'd love to know if you ever write up a pattern for those wrist warmers, they're beautiful !! Oh they look delightful! :) I could just curl up with them! oh wow the yarn looks so yummy....and love the wrist warmers! Heather, I am so late visiting you but I simply had to write that I have loved this post. First your wristwarmers are DELIGHTFUL! I absolutely love them. Second, it is so good to 'meet' somebody else who has fallen for the charms of Rooster yarns. They are so amazing, aren't they? Totally soft, homely and opulent all at the same time. Blissful. I hope your week is a peaceful, joyful one.